One must be thoroughly familiar with the properties and safety considerations before handling a cryogenic liquid and its associated equipment. The eyes are the most sensitive body part to the extreme cold of the liquid and vapors of cryogenic liquids. 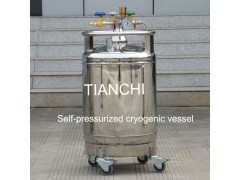 The recommended personal protective equipment for handling cryogens includes a full face shield over safety glasses, loose-fitting thermal insulated or leather gloves, long sleeve shirts, and trousers without cuffs. In addition, safety shoes are recommended for people involved in the handling of containers. Depending on the application, special clothing suitable for that application may be advisable. A special note on insulated gloves: Gloves should be loose-fitting so they are able to be quickly removed if cryogenic liquid is spilled on them. Insulated gloves are not made to permit the hands to be put into a cryogenic liquid. They will only provide short-term protection from accidental contact with the liquid. In emergency situations, self-contained breathing apparatus may be required.